Common interface for all types of values used with metadata. The interface provides a uniform way to access values independent of their actual C++ type for simple tasks like reading the values from a string or data buffer. For other tasks, like modifying values you may need to downcast it to a specific subclass to access its interface. 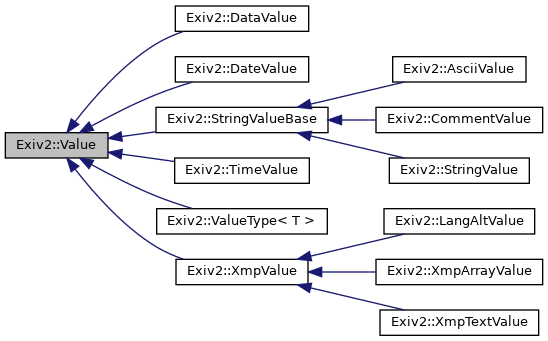 Implemented in Exiv2::ValueType< T >, Exiv2::TimeValue, Exiv2::DateValue, Exiv2::XmpValue, Exiv2::CommentValue, Exiv2::StringValueBase, and Exiv2::DataValue. A (simple) factory to create a Value type. typeId Type of the value. Auto-pointer to the newly created Value. The caller owns this copy and the auto-pointer ensures that it will be deleted. Return a copy of the data area if the value has one. The caller owns this copy and DataBuf ensures that it will be deleted. A DataBuf containing a copy of the data area or an empty DataBuf if the value does not have a data area assigned. Reimplemented in Exiv2::ValueType< T >. Implemented in Exiv2::ValueType< T >, Exiv2::TimeValue, Exiv2::DateValue, Exiv2::LangAltValue, Exiv2::XmpArrayValue, Exiv2::XmpTextValue, Exiv2::XmpValue, Exiv2::CommentValue, Exiv2::AsciiValue, Exiv2::StringValueBase, and Exiv2::DataValue. Set the data area, if the value has one by copying (cloning) the buffer pointed to by buf. Return -1 if the value has no data area, else 0. Implemented in Exiv2::ValueType< T >, Exiv2::ValueType< T >, Exiv2::ValueType< T >, Exiv2::TimeValue, Exiv2::DateValue, Exiv2::LangAltValue, Exiv2::XmpArrayValue, Exiv2::XmpTextValue, Exiv2::StringValueBase, and Exiv2::DataValue. Implemented in Exiv2::ValueType< T >, Exiv2::ValueType< T >, Exiv2::ValueType< T >, Exiv2::ValueType< T >, Exiv2::ValueType< T >, Exiv2::TimeValue, Exiv2::DateValue, Exiv2::LangAltValue, Exiv2::XmpArrayValue, Exiv2::XmpTextValue, Exiv2::StringValueBase, and Exiv2::DataValue.